Just when you thought you had every trout rod you could possibly need, Sage comes out with its One Trout Spey Fly Rod and makes you reconsider why you're spending your days staring at a bobber when you could be making spey casts and hooking into trout on the swing. 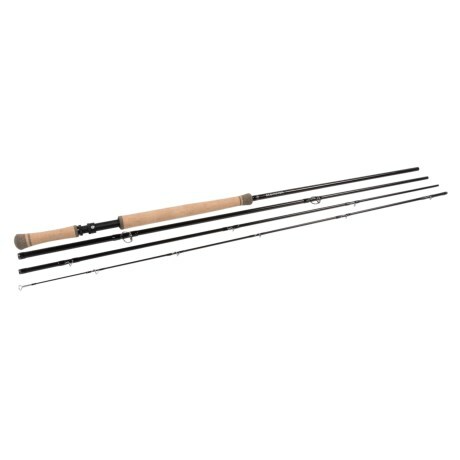 Made with Sage's Konnetic technology, this lightweight, two handed spey rod is delicate enough to protect light tippets and small trout flies, while offering the power needed to make long distance spey casts to the far bank. Being a member of Sage's flagship One series, the One Trout Spey has that same fast action feel that will push moderately weighted streamers out where the fish are, while maintaining the sensitivity needed to detect the strike.Like all Sage rods, the One Trout Spey is made in Bainbridge Island, WA and is fitted with all the top shelf components you'd expect to find on a Sage. The blank has a nice black ice color with black thread wraps and a bronze trim. The two handed spey handle is composed of a Super Plus cork material for a solid and comfortable casting feel, while the stripper guides are made from Fuji ceramic material and the snake guides are a hardened chrome, resulting in a smooth and fast feel as the line passes through the guides. The rod comes with a black rod bag and powder coated aluminum rod tube with a Sage Medallion at the end. Your browser isn't supported for displaying eBay items. Go to eBay to search for Sage One Trout Spey Fly Rod 4 Piece.